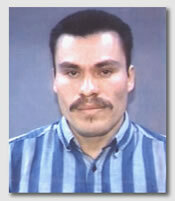 ZENDEJAS murdered his supervisor, on 06-13-98, in the area of Union Sugar and Central Avenue, Lompoc. ZENDEJAS is believed to have fled to Mexico to avoid apprehension and prosecution. If anyone has new information about the murder, not previously reported to the Santa Barbara County Sheriff’s Department, please contact Lt. Eric Koopmans, at (805) 681-4100, between 8:00 am and 5:00 pm, Monday through Friday. If you have information regarding the whereabouts of Sergio Tapia Zendejas, notify local law enforcement authorities or contact Santa Barbara County Sheriff’s Detective Bureau.